Adeona is an open source internet-based laptop tracking system that is free to use. It’s available for Linux, OSX, and Windows XP/Vista. After installation, Adeona will submit at random intervals, anonymously encrypted updates on the computer’s location to servers on the Internet, specifically to OpenDHT, a free storage service. The information is kept on the servers for one week. If your laptop becomes lost or stolen, you can use the retrieval tool to access information about where your laptop was last used: the external IP address, internal IP address, and nearby routers. If your laptop is a Mac, you can also download isightcapture to grab a picture of the thief. Adeona is designed to protect against common criminals who may not have much technological knowledge, and does not have any protections against events such as disk wipes. 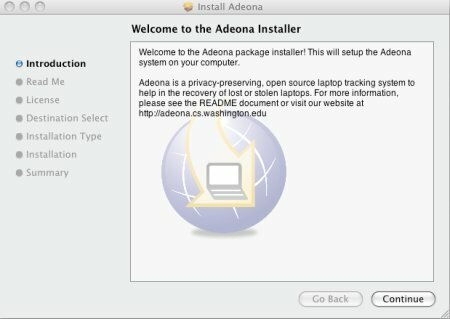 The open source nature of Adeona’s system means that there’s ample opportunity to improve upon the release or add extensions. Here’s one user who really likes what he sees. A wry editorial on Time Magazine’s site about tapping into your neighbors’ Wi-Fi tells of how the author [Lev Grossman] stole internet access from his neighbors’ open networks for years. He finally decided to pay for his own connection, which he fittingly leaves on an open network. He makes the point that leaving it open is a violation of his TOS agreement, but he doesn’t seem particularly bothered by the notion of people tapping into his network. [Bruce Schneier] takes an even stronger stance on the issue, suggesting that it is not only safe to leave your network open, but a matter of politeness toward your guests, similar to providing them with basic amenities. He also mentions that if your computers are not adequately secured, network security won’t make much of a difference. We tend to agree with [Schneier] on this: we also leave our network completely open. That’s not to say [Grossman] doesn’t have a point about the unreliability of pilfered internet access, noting “I always seemed to lose connectivity just when I was about to send a crucial e-mail.” Sure, we leave our network open, but we have to pay for our internet access. We really can’t afford not to. One thing [Grossman] didn’t mention (neither did [Schneier], but he wrote his article before this happened), is that a Maryland bill that would criminalize leeching Wi-Fi has been shot down. The first legislation of its kind, the defeat of the bill mean citizens of Maryland are free to leech from open networks without fear of prosecution, but it sets a precedent that may influence future rulings. The most immediate threat to the average person is crime – in particular, fraud. And as I said before, even if you don’t store that data on your computer, someone else has it on theirs. But the long-term threat of loss of privacy is much greater, because it has the potential to change society for the worse. What you’re really asking me is about the security. No one steals credit card numbers one-by-one, by eavesdropping on the Internet connection. They’re all stolen in blocks of a million by hacking the back-end database. It doesn’t matter if you bought something over the Internet, by phone, by mail, or in person – you’re equally vulnerable. We already knew he doesn’t secure his WiFi (neither do we) and you’ll find many other interesting discussions in the article. If you want Bruce Schneier facts though, you’ll have to look elsewhere.